Elvis Presley sold 75 million records by December of 1960, becoming the first artist in history to do so. 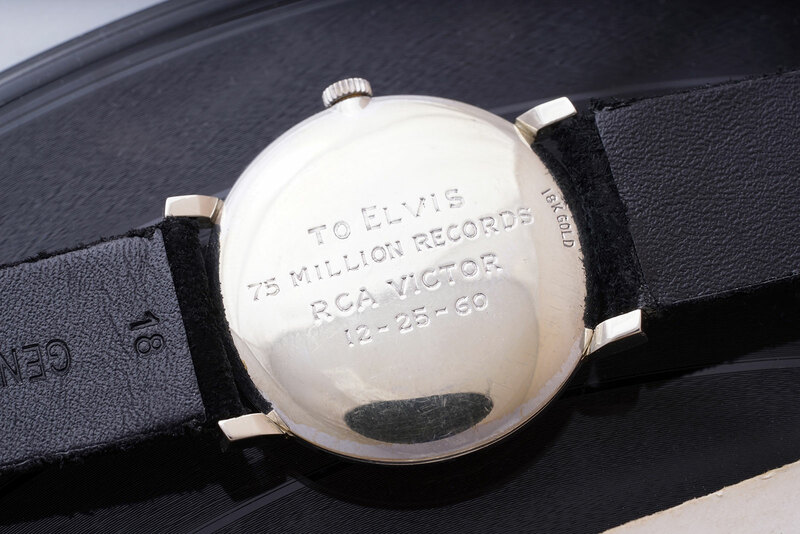 In February 1961 RCA Victor organised a celebratory charity concert, during which Elvis was presented with a plaque as well as a white gold Omega wristwatch engraved for the occasion. Elvis then swapped the Omega for a diamond-studded Hamilton that was owned by the uncle of the current owner, who has now consigned it to Phillips, the auction house best known for selling the most expensive wristwatch ever, Paul Newman’s “Paul Newman” Rolex Daytona. Phillips’ watch department was set up to cater to serious minded watch collectors – watches are the most high-profile and successful category for the London-based auction house – so the Elvis watch is a bit of diversification. Historically rivals like Heritage Auctions, the largest domestic auction house in the United States, have been leaders in the memorabilia and collectibles market. Elvis watches are not exceedingly rare, since the singer appeared to have owned a good number of them – estimates range from several dozen to several hundred – over his life. Several have come up for sale in the past, including an Omega Constellation that sold for almost US$40,000 at Antiquorum in 2014, as well as a Hamilton Ventura that was about by Hamilton itself for just over US$30,000 in 1999. 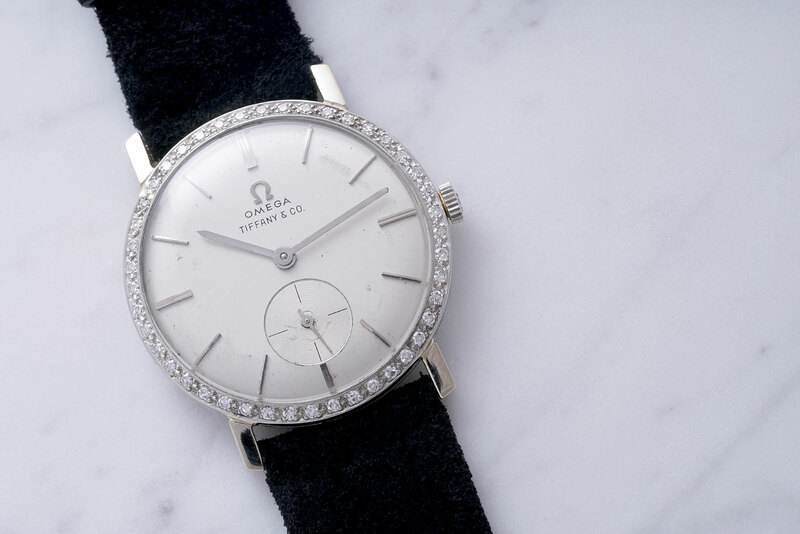 This Omega, however, is more significant, having been gifted to mark a major milestone in the singer’s career, explaining the low estimate that’s equivalent to US$50,000, or about 10 times what a similar watch without the Elvis provenance would get. The watch itself is unusual, being 18k white gold, instead of yellow gold, the predominant material for such watches at the time. And it is a very American watch: the case was produced domestically by New York-based case maker Jonell Watch Case Company, and the cal. 510 bears the American import marks “OXG”. 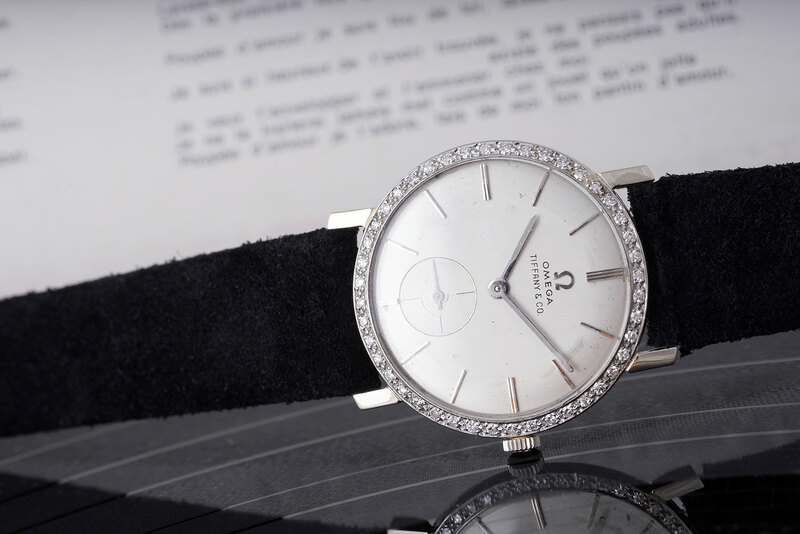 It was also sold by Tiffany & Co., explaining the double signature on the dial at 12 o’clock. The also accompanied by certificates from the Elvis Presley Museum, as well as a copy of Elvis, a book by Dave Marsh that include photos of Elvis at the charity concert wearing the very watch. Estimated at SFr50,000 t0 SFr100,000, the Elvis Omega will be sold at the Geneva Watch Auction: Seven that takes place on May 12 and 13.